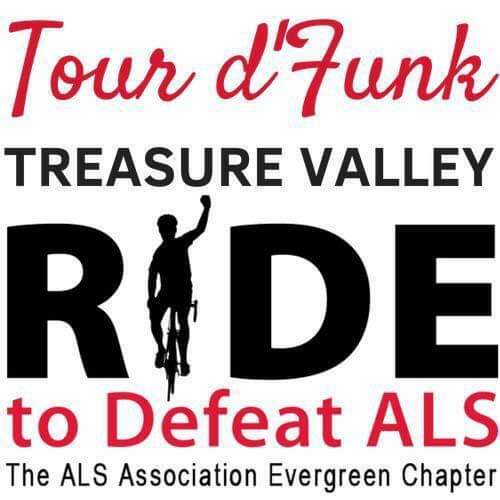 Welcome to “Tour d’Funk” Treasure Valley Ride to Defeat ALS! Our one day cycling event includes participant support from start to finish, with crewed stops, volunteers, and a safety team. The ride starts and finishes at Stephen C. Guerber Park at the Sunrise and Sunset shelters. We will be raising funds to fight Lou Gehrig’s disease. We encourage our friends living with ALS and their caregivers to join the event. How to Register? You can register online in three ways: 1. Join a Team — If you are joining an existing team, you can search for your team and register yourself here. 2. Start a Team — If you plan to captain a new team and are ready to get the wheels rolling, get started here. 3. Join as an Individual — If you are signing up on your own, you can get started here. We ask that each participant raise a suggested minimum of $150 as they prepare for the Ride. Fundraising for The ALS Association is a direct way of supporting our mission, but with each person you ask to support you, you are also spreading important awareness for ALS. Fundraising is easy and fun — and we are here to help you get started and to surpass this fundraising goal! This year we have a new way to register called “Supported Rider.” As a Supported Rider there will be no up-front registration cost, but a fundraising minimum of $250 will be mandatory. For questions about this option, please contact Amara Bates at (509) 863-4321 or amara@alsa-ec.org. 9:20 Ride begins! Gather your team for a team photo. You can begin the Ride after team photo has been taken. Download to your Garmin Edge, iPhone, Android, or Wahoo device.